Southpointe High is the last place Lucy wanted to wind up her senior year of school. Right up until she stumbles into Jude Ryder, a guy whose name has become its own verb, and synonymous with trouble. He's got a rap sheet that runs longer than a senior thesis, has had his name sighed, shouted, and cursed by more women than Lucy dares to ask, and lives at the local boys home where disturbed seems to be the status quo for the residents. Lucy had a stable at best, quirky at worst, upbringing. She lives for wearing the satin down on her ballet shoes, has her sights set on Juilliard, and has been careful to keep trouble out of her life. Up until now. 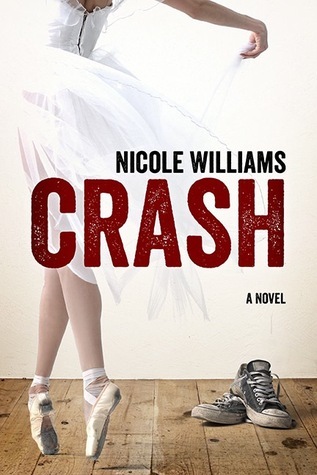 I have been quite eager to read Crash by Nicole Williams and although it was a book which kept me turning the pages, there were unfortunately too many elements which didn’t mesh well with me. When Lucy Larson first glimpsed Jude Ryder on the beach she was immediately attracted to him but things quickly change when Jude opens his mouth and his arrogance shows; Lucy knows all too well he is someone she should steer clear of but for some reason she is drawn to him. Jude is smexy, cocky and has a rap sheet pages long; living in a boys home he has no-one to rely on but himself, with his mother abandoning him and his father serving time for murder in prison, he is a hardened, tortured character but quite intrigued by Lucy. My feelings towards both characters fluctuated over the course of the book, one minute all was rosy and I was really hoping things would work out for them, their chemistry was wonderful and they seemed to mesh well but in the next one or the other would do something completely idiotic – more so Jude with his volatile temperament and anger issues but Lucy and her attitude didn’t serve her too well on occasion as well and I’d be left shaking my head or wanting to smack them upside theirs! A few plot points were far fetched and things came too easily, I need my books to hold a decent amount of believability for me to fully appreciate it; unfortunately there was a lot happening which didn’t hold true – like Jude and his football achievement as well as the whole Sawyer storyline; there was also something quite serious which took place at the beginning of the book which I felt lacked emotion despite what took place, I would have needed months of counseling! This event seemed to be downplayed. Nicole Williams has created an angst and drama filled story, her writing is engaging (I love her Eden trilogy) and despite not completely connecting with everything being told, it was a page turner none the less. I have a copy of book 2, Crush so I will be continuing on with this series in the hopes Jude does find some hope and redemption. Crash has received a lot of praise from others, so please stop by Goodreads for other reviews. Hm. Sorry to hear you didn't enjoy this book as much. I'd been eyeing this series for sometime. Might have to pass on it though. Nice review. Thanks Felicia, I had high hopes for this one. I've been debating whether I want to read this book or not for some time now. I really love the new adult genre, but I had heard about the love interest, Jude and his temper issues. Your review just confirmed that. I need some amount of believability in books too. Lately, it seems that some authors are going over-board with their hero/heroine's issues, so it doesn't seem very realistic. I think I'm going to stay far away from this book. Thanks for the honest review, Sharon! Thanks Nick, I really need to be able to connect with the story & the characters but unfortunately I wasn't able to in this book. I've been looking forward to this book for quite sometime now as well! I'm sorry it kind of disappointed you. The quote you provided for us of Jude really kind of disgusts me. That's a little rude! I'm not very excited for this book anymore, but I still want to try out Williams' writing. Thanks for the honest & wonderful review, Sharon! Thank-you Jen, I really enjoyed Nicole Williams Eden novels. Jude was an unusual character, I wasn't charmed by him unfortunately because he annoyed me more often than not. I have her Eden trilogy to read eventually and this one that I've let sit there for a long time even though some people I know have loved it. It seems like it's a love it/dislike it kind of book. I'm really glad to hear your honest review of it and exactly why you didn't like it - it's exactly what I've heard from other people too and the things I know I wouldn't like. I haven't picked up the second book and I think I'm going to cut my losses and not waste my time with Crash either. Excellent review!! Thanks Barbara :) after reading so many NA books lately my expectations were quite high. I much enjoy her Eden trilogy.